Multiple generations of Disney theme park visitors can easily supply the last five words of that stirring introduction. It’s the Main Street Electrical Parade, and when the Disney crew packs away its 575,000 lights in a few weeks, its latest run in the Magic Kingdom will draw to a close. The unique parade is set to return to its roots at Disneyland, where it first took to the streets in 1972. It may have debuted there, but the Disney staffers who created it took inspiration from an early entertainment at the Walt Disney World Resort. The Electrical Water Pageant began a few weeks after WDW opened in 1971 (and continues to this day). It consists of tall, lighted screens on a string of musical barges towed around the Seven Seas Lagoon for the benefit of hotel guests. Kingsley was a producer at Vanguard Records in New York when he and Perrey, a Frenchman who had been working in the U.S. as an organist, got together to see what they could create in the relatively new field of electronic music. Perrey was known as an inveterate experimenter, always trying to build musical compositions from sounds beyond what might come out of conventional instruments. “In a beehive in Switzerland, I recorded miles of magnetic tape,” he wrote in his autobiography. “It took a titanic amount of labor, 46 hours of cutting and gluing itsy-bitsy pieces of magnetic tape together for the final result: two minutes of music. I think I was a little crazy back then…” The tune? Flight of the Bumblebee, of course. The original Disney version was recorded by synthesizer programmer Paul Beaver and music director Jim Christensen. Jani decided to build the entire parade around the theme. Music from Disney movies was inserted into the sound track to synchronize with “Baroque Hoedown” and to accompany each lighted float derived from the movie. Sensors installed along the parade route would ensure that guests heard the appropriate music at the right time. The Main Street Electrical Parade ran from 1972 to 1974 at Disneyland before being halted in favor of a Centennial-themed parade. A college student named Don Dorsey was hired to produce the Moog synthesizer soundtrack for that parade, titled America on Parade. 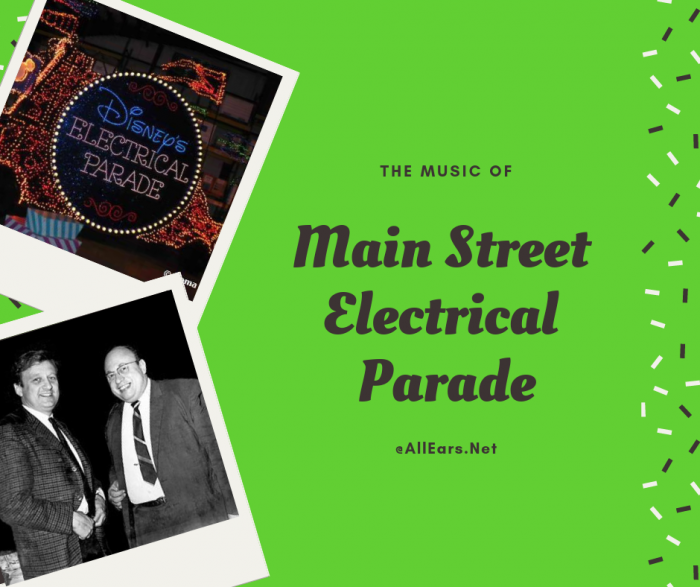 When the Main Street Electrical Parade was scheduled for return in 1977, Dorsey “plussed” its soundtrack by adding opening and closing fanfares, rearranging some of the music, and incorporating the opening “electro-synthe-magnetic” announcement. In 1979, the opening announcement was recorded by Jack Wagner through a device called a vocoder to give it its robotic sound. Over its history, music themes — and floats — have been added and deleted from the parade in order to promote specific films and remain current, but “Baroque Hoedown” remains its essential theme. The nighttime parade ran at Disneyland until late 1996. Walt Disney World’s version of the parade began on June 11, 1977, running until 1991 when it was shipped off to Disneyland Paris. It returned in May 1999 and closed in April 2001. Its third engagement began on June 5, 2010, and is scheduled to end on October 9, 2016. Author’s Note: Recordings of the Main Street Electrical Parade sound track seem to be limited to Disneyland reissues. The most recent release is a 9-minute version in “The Legacy Collection — Disneyland,” a three-CD set (Walt Disney Records, 2015). It also can be found in 5-minute versions on “Official Album — Disneyland/Walt Disney World” (Walt Disney Records, 1991) and on “The Music of Disney – A Legacy in Sound,” a three-CD boxed set (Walt Disney Records, 1992). A true collector’s item is a limited-edition 7-inch LP recording of the original parade soundtrack issued in 1973. Interesting non-Disney versions include the CD “Heigh Ho Mozart,” Disney tunes in the style of various classical composers, with “Baroque Hoedown” by Vivaldi (Delos, 1995); and on “A Disney Spectacular” by Erich Kunzel and the Cincinnati Pops Orchestra (Telarc, 1989). A professional journalist for more than 30 years, Al Krombach has worked for several Florida newspapers and retired in 2015. He is an alumnus of the Florida State University College of Music and has worked with a variety of musical groups (as an instrumentalist) and choirs (as a director). He and wife Vicky have three children and five grandchildren, every one a Disney fan. They are longtime Disney aficionados and have accumulated more than 250 park visits since the World began. EDITOR’S NOTE: Would you like to be an AllEars® Guest Columnist? Check out our Writers’ Guidelines and send your idea for a feature to AllEars® Editor Deb Koma HERE.